A short follow up regarding my previous post. Michael Hoffman is actually making a library called Selene capable of nailing down quite many items from my list. No .RGBE and .EXR support so far (both are vital for me), but pretty solid otherwise. This entry was posted in Android on November 6, 2018 by Sergey K..
For decades I was using FreeImage as a “backend” images loading/saving library which I wrapped into my own Bitmap class providing additional image manipulation functionality on top: convert colors, blit, resize, convolve, move channels around, cut & paste, and so on and so forth. The Bitmap class has been evolving for almost 15 years to become what it is now, a true abomination combining different coding styles and looking like a patched stovepipe with numerous ugly fixes and hacks. While it is still doing its job, it is becoming more and more difficult to support and maintain it. A full-featured clean image manipulation library would be really nice to have. Here is my features wish list for it. Support 1D, 2D, 3D and Cube images. I’m doing graphics and using this class as a staging ground to upload textures to GPU. 1D image can be a particular case of 2D image with the height of 1, 2D image can be a case of 3D image with the depth of 1, and Cube image can be a 3D image with the depth equal to 6. Should be able to convert equirectangular projection to a cube image and back. Should be able to convert vertical/horizontal cross image to a cube image and back. Should be able to extract a 2D slice from a 3D image (and write it back as well). Support different pixel formats. 8/16/32-bit unsigned/signed integer. 16/32-bit floating point. Arbitrary number of channels, R/RG/RGB/RGBA. Basic image operations like GetPixel, SetPixel, Resize, Flip, etc should work with all these basic formats. GetPixel should support bilinear and trilinear (for 3D textures) filtering. Cube image lookup should support seamless mode. Some notion of channels semantics. All flavours of RGB-BGR, RGBA-BGRA, ARGB-RGBA, etc conversions. Different color spaces (CMYK, Lab) desirable but are not a show stopper. Conversion from sRGB to linear color and back. Support of some esoteric formats to store compressed image data and upload it later to GPU. ETC2/ETC2_EAC is a minimum here. Basic image operations can skip all work with these formats. That’s it, just storage. Blending operations. Normal, Lighten, Darken, Multiply, Average, Add, Subtract, Difference, Negation, Screen, Exclusion, SoftLight, HardLight, VividLight, PinLight, LinearLight, HardMix, ColodDodge, ColorBurn, LinearDodge, LinearBurn, etc. The library should not be too pessimized on performance if compiled with -O0 optimization (many C++14/17/20 libraries have this). Should be able to run the code in debug builds reasonably well. Load and save different image formats. JPEG, PNG, HDR, KTX, RAW (uncompressed pixels, mostly for 3D textures) loading and saving are vital necessary. EXR loading is necessary as well, however, saving is optional. Load and save from/to files and memory. Move channels around. “Take the 2nd channel from this image and put it into the 1st channel of this one”. Some rudimentary drawing operations: ClearColor, FillBox, MakeXorPattern, line drawing, etc. Store mipmap levels (just having a NextImage pointer will do). Treat mipmaps well while loading and saving image formats which support them (KTX). Calculate normal maps from heigh maps and height maps from normal maps. Should have configurable dependencies. All supported image formats should be optional and configurable at will. Support multiple image loading/saving backends switchable at compile time. For example, libpng/libjpeg vs stb_image. This entry was posted in Android on May 28, 2018 by Sergey K.. This entry was posted in Android on November 29, 2015 by Sergey K..
Our Android NDK development book is out. 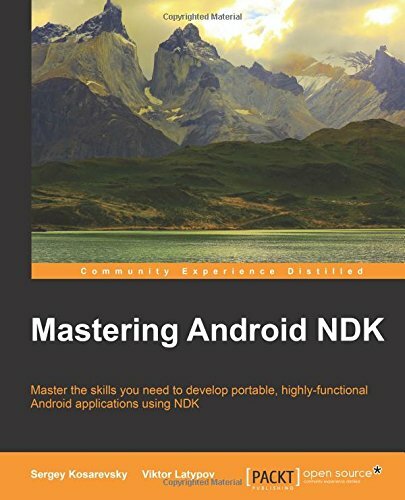 This is a sequel to out previous book Android NDK Game Development Cookbook. More examples of how to write portable code for mobile platforms in C++. This entry was posted in Android on October 5, 2015 by Sergey K..
Was writing this code in Visual Studio 2015. Note the ‘auto’ specifier in the lambda parameter list. Ended up with this code to stay compatible with Visual Studio 2013. This entry was posted in Android on August 5, 2015 by Sergey K.. This entry was posted in Android on December 22, 2014 by Sergey K.. This entry was posted in Android on October 31, 2014 by Sergey K..
As a zealous Windows fan and developer, I use Far Manager to do all file managing and significant amount of coding. When it comes to Linux or OS X, I feel like a fish dragged ashore. That is it: no familiar UI and hotkeys to dig through my files and type my code. It is painful because I need to switch between Windows/Linux/OSX and cannot live on a single system. Somewhat over a year ago, I found a portable open-source file manager called Wal Commander, which was pretty close to what Far Manager is on Windows. I started using it and found some nice features missing, which I was able to add. The original author was very slow on development and integration of patches, so I decided to put up a GitHub repository and stockpile all my contributions there. Since then, several people contributed to the project to improve it and make it usable on FreeBSD. The project has evolved too far from the original source code (working FreeBSD port, tons of new features, step-by-step refactoring and code improvement) and I renamed it to Wal Commander GitHub Edition. The project is growing and looking for volunteers to establish a working OS X port. This entry was posted in Android on September 3, 2014 by Sergey K..
We are now running a crowdfunding campaign on Indiegogo for our new picture-puzzle game with a 3D user interface Linderdaum Jigsaw Puzzle. If the target amount is hit, the game will be open-sourced. The project is based on OpenGL 3 and OpenGL ES 2 and will be available on Android this year. iOS, Windows, Mac and Linux ports will be available later. This entry was posted in Android on August 14, 2014 by Sergey K..
Smart pointers are often passed by const references. C++ experts, Andrei Alexandrescu, Scott Meyers and Herb Sutter, speculate on this topic during C++ and Beyond 2011 ([04:34] On shared_ptr performance and correctness). Basically, a smart pointer that is passed-in by const reference already lives in the current scope, somewhere at the call site. It may be stored in a class member and you may do something that clears that member. But this is not the problem of passing by reference, it is the problem of your architecture and ownership policy. However, this post is not about correctness. It is about performance and what we actually can gain by switching to const references. The first impression may be that the only thing we will get is avoidance of atomic increments/decrements in copy constructor and destructor. Let’s take a closer look and write some code to understand what is going on behind the scenes. All the calls are in their places and what we only save here are two expensive atomic operations. lock subl	$1, (%eax)		// .. and this is DecRefCount(). Quite impressive. P.S. Herb Sutter has a very elaborate essay on the topic, covering the C++ side in great detail. This entry was posted in Android and tagged C++, smart poitners on July 3, 2014 by Sergey K..